So good news and bad news this month. Good news, as promised, we have a T-64 release: the T-64A (both with gill armour or with skirts) in 144! Photos, as usual, from the Rep 2 prototypes! The bad news is that that's the only version at the moment. 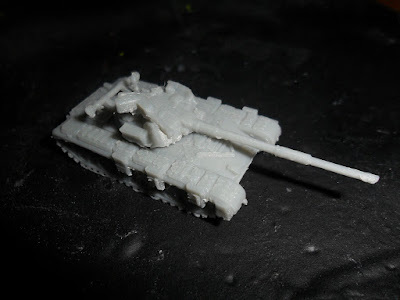 On top of conventions, illness (today has been the first day since the start of October I've been able to put a full day's work in) and other sundry issues, the T-64 has proven to be nightmarishly difficult for various reasons – only being able to work at it in short bursts among them. It's been a long haul, with the unfinished vehicle hanging over me like the sword of Damocles! Once again I have to thank UsmanK, who provided me with some Russian-language links which enabled me to find some better walkarounds without which it would have been even harder. I now have a commission coming in (and to be honest, I'm quite heartily sick of the T-64 at this point! ); so November's release may be from the backlog, but once I've done that commission, the next on the list is the T-62M or maybe the T-64B or a modernisation. 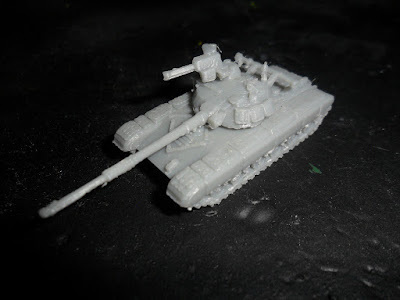 T-62M seems slightly more likely at this point (as we could be into December, which is another short work-month) – also, as stated, I'm fed-up at looking at T-64s for the moment – but as always such plans are only ever nominal!